Yoshiko Wada’s Slow Fiber Studio tours encourage creativity, sustainability and the study of traditional artisan communities. 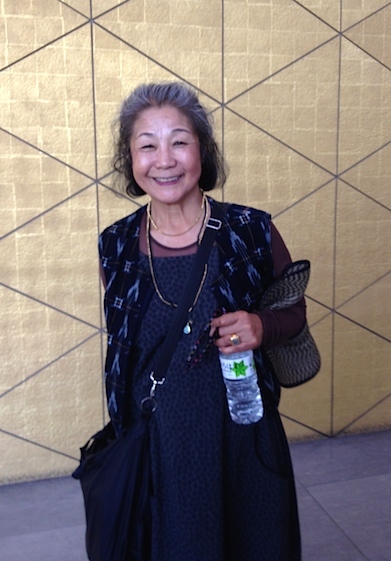 Sixteen of us joined her 2014 Slow Fiber Studios tour to Japan – an annual event. In picturesque Miyama Village, we spent a day learning the fine points of dyeing rustic hand-twisted open weave hemp cloth with famed indigo dyer Hiroyuki Shindo. 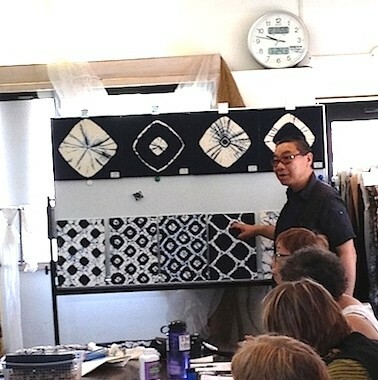 Later a rare visit to Arimatsu Hari Sho itajime (clamp resist) workshop elucidated the complex process of mame shibori (bean pattern). 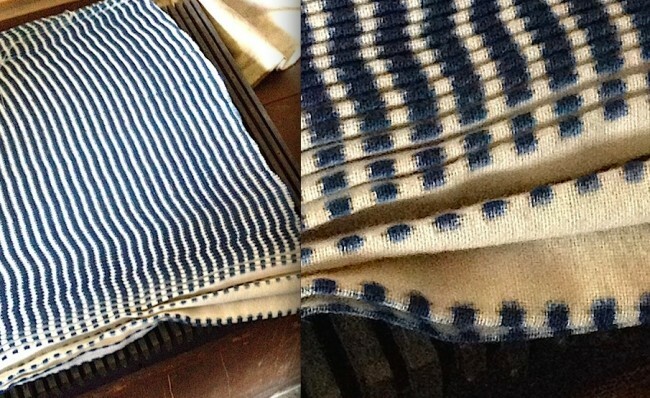 The cloth is dyed in indigo using a combination of carefully offset pleating and clamping between boards with carved channels to create a popular dotted pattern for Japanese tenugui (towels). 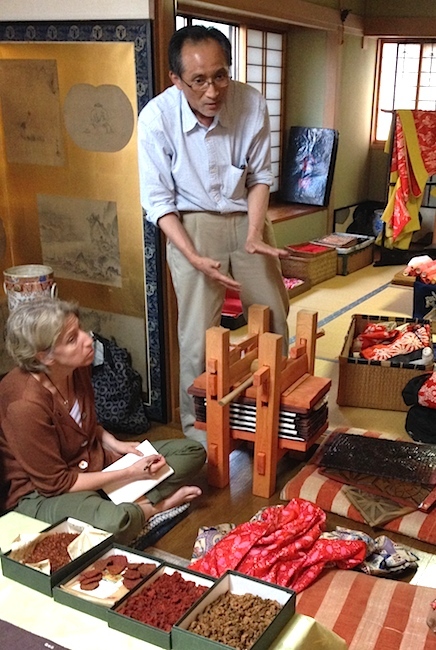 In addition to hands-on workshops, we traveled around Japan acquiring a deeper understanding of the history and current state of the Japanese silk industry. In Gunma Prefecture we visited Takasaki Nippon Silk Center, a great educational resource about the once flourishing Japanese silk industry. Contemporary endeavors to genetically modify silk worms for modern high tech fabrics have produced new strains of silk worms that spin yellow, red and even fluorescent silks. Other new silks have anti-microbial properties. 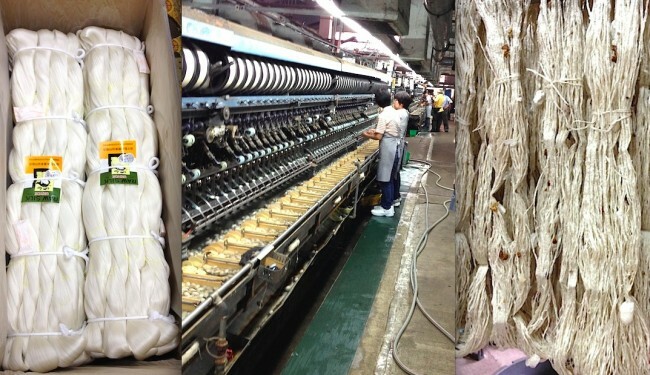 We mourned the scant production of Japanese silk in the 21st century – where less than 1% of what is now used is local – due to high production costs. We next saw sericulture in action when Mr. Uehara explained how for 40 years he has raised silkworms on his farm and has grown mulberry whose leaves feed the hungry little beasts 2-3 times a day until they are ready to spin the precious cocoons. 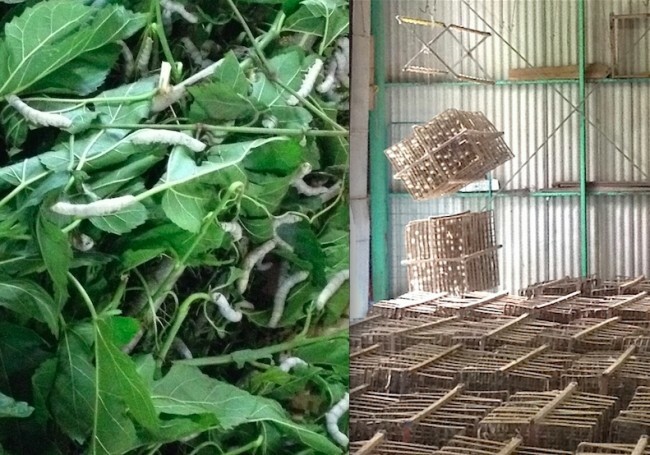 We saw thousands of silk worms placed by hand in custom-made divided boxes that are rotated to encourage even distribution of the silk filament. The cocoons are harvested 3 times a year. The work is demanding and the remuneration low. We also visited Usui Seishi – one of only two filature (reeling factories) in Japan. The finest yarn is made by soaking cocoons and unraveling 7 to 8 filaments together into a single 21-denier thread. 56 years ago, when this mill was founded, there were more than 80,000 family farms raising silk worms. 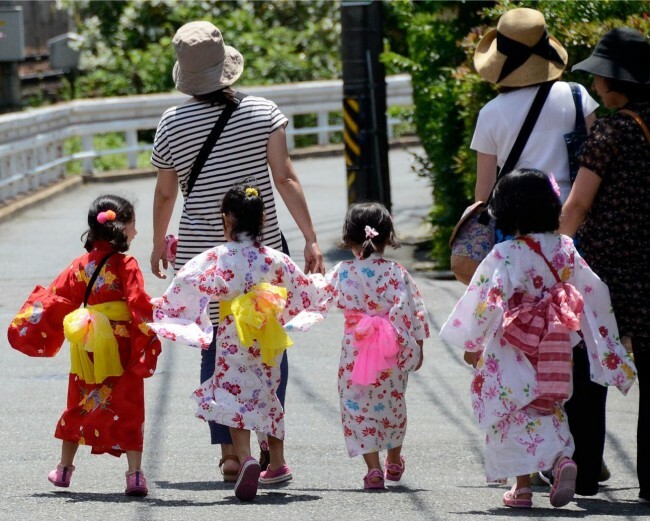 Now fewer than 500 remain in all of Japan. Complex machines have mechanized the reeling process such that 2 workers now do what once took 80, and yet the highest standards are maintained. Although Usui Seishi is known for fine lustrous white yarn, many of us were attracted to the sculptural possibilities of their stiff rustic kibisu yarn reeled from the outer cocoon. Formerly considered a waste produce, this yarn is now prized by contemporary artists including Kiyomi Iwata. 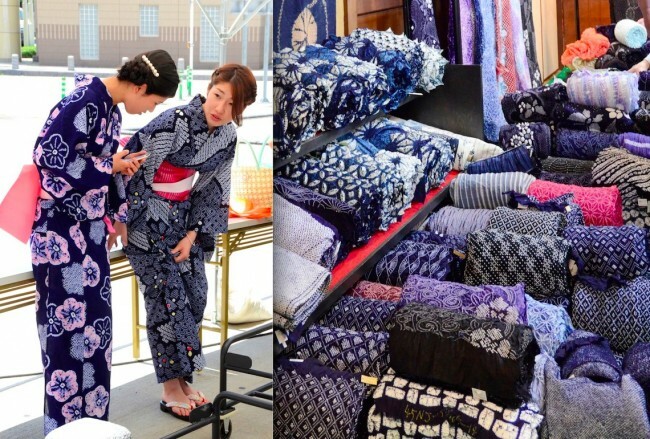 Sadly, the once iconic silk industry in Japan is dwindling despite government subsidies. Also on the theme of silk, we had a privileged visit to the private home of Mrs. Haruko Yoshimura, an artist from a textile family whose small factory specialized in red resist-dyed inner kimonos for 3 generations. These inner layer kimono were only glimpsed in public, yet great attention went into their kyokechi (carved board clamped resist) and beni (safflower) dyeing. 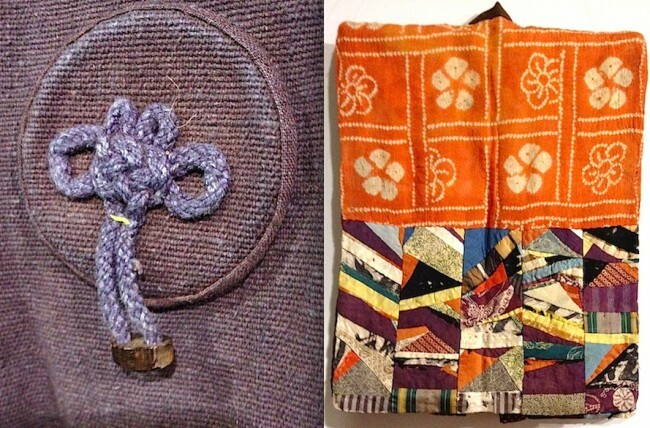 Thanks to Mrs. Yoshimura and textile scholar Masanao Arai, this ancient technique is being revived. Masanao explained the time consuming technique of achieving the patterned cloth, including the possibility of manipulating the tightness of the clamps for a shadow of light pink in contrast to the dramatic red motifs. With our deeper knowledge of historic practices, we next explored Kiryu for a sense of what is new in textile production for high fashion. Wada lectured on the transformation of impoverished post-war Japan into a modern nation with the help of American concepts of quality control. The Japanese affinity for precise machinery evolved from textile production into electronics and the auto industry. Toyota manufactured looms before cars! Industrial production has in turn enriched cutting edge textile concepts like slit yarn woven and pleated by Junichi Arai. We visited Kiryo Orijuku Archives founded by Wada’s colleague Kazuo Mutoh. Now too frail to participate, Mutoh’s archives remain an invaluable resource where Motome and Masanao Arai continue the important work of cataloguing Kiryu and Meisen textiles. Treasures by Junichi Arai, 2 younger designers – and even a few of Mr. Mutoh’s sophisticated aluminum melt-off hangings – were available for purchase. The famed master himself, Junichi Arai – and his lovely wife – joined us for lunch. Their affection for Yoshiko Wada was very moving. Later that day we visited an amazing high-tech embroidery factory. “Embroidery” can mean any of a myriad of post-production manipulation/embellishment techniques on fine designer fabrics for the fashion industry, including needle felting and laser cutting. 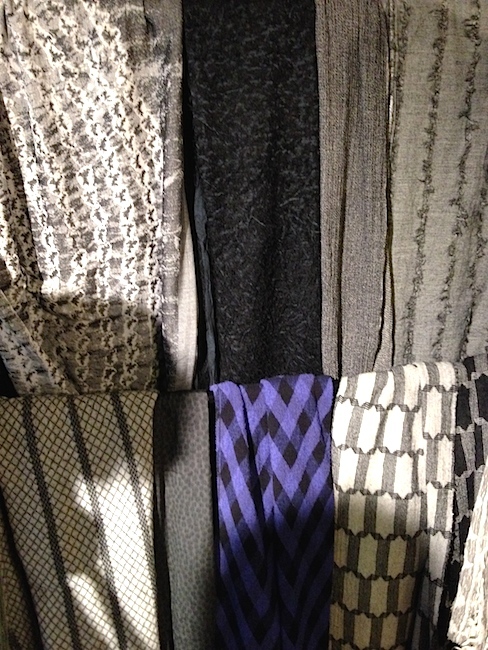 At fabric designer Osamu Mita’s factory we saw his exciting work that graces the catwalks in Paris and New York. In his showroom many of us were invited to purchase lengths of creatively engineered and partially elasticized silk yardage to make into skirts. It is interesting that the various Kiryu weaving, embroidery and lace factories collaborate and share machinery to complete complex designer commissions. In Tokyo, we saw how some remarkable fabrics are transformed by cutting-edge Japanese fashion designers such as the great Issey Miyake (textiles from past seasons shown at left), popular designers at Dover Street Market, and Reiko Sudo at Nuno fabric showroom. It was exciting to see California designer Christina Kim of Dosa featured as well. After visiting many museums and galleries, including Jurgen Lehl’s elegantly restrained Babaghuri, there was just enough time before leaving Tokyo to see the private Iwatate Folk Textile Museum, where Hiroko Iwatate described objects from her large collection. 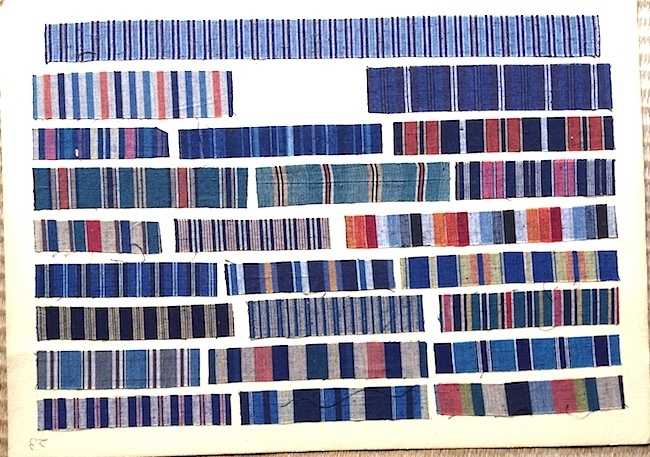 I loved the 6 paper garments (one woven of incredibly fine indigo-dyed twisted paper warp and weft), the indigo-wrapped bundles and the variety of other clothing – from a rustic elm bark Ainu robe to a “hundred pieces” amuletic child’s vest made of small patches of silk fabric. These traditional garments anchor the modern fashions we had seen in the rich history from which they had evolved. Weeks later, with all my treasures and new art materials sorted through, I remain amazed at the incredible experience we had with Yoshiko Wada – and the special access her scholarship and research offer anyone fortunate enough to take a one-of-a-kind tour of the best in Japanese textile arts – past and present. Barbara Shapiro is a weaver, dyer and basket maker (and SDA member). She has taught at San Francisco State University and workshops around the U.S. and enjoys sharing her rich knowledge of historical and ethnic textiles and her broad technical experience. 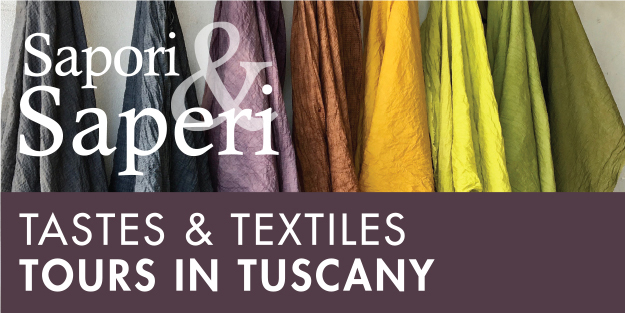 Shapiro’s hand woven silk wall works and plaited and coiled baskets have been exhibited internationally. 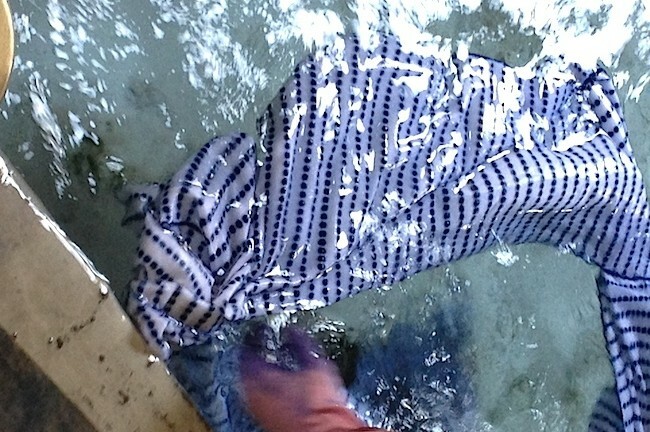 Indigo dyeing, her specialty, informs much of her current work. Her artwork and writings on textile subjects are widely published. 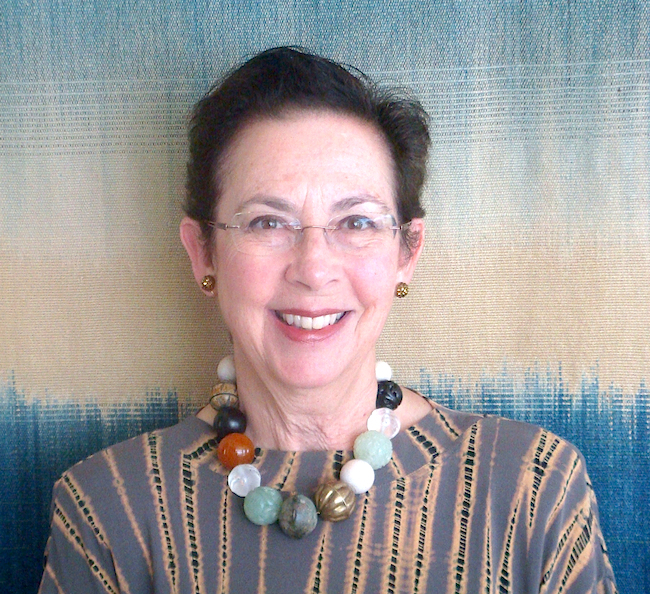 She is a past board member of Textile Society of America and an advisor to San Francisco Fine Arts Museums’ Textile Arts Council. Visit artist, author, independent scholar, entrepreneur (and SDA member) Yoshiko Wada‘s World Shibori Network for related information. Barbara, A wonderful report. Makes me wish I'd been there with you. Thanks so much. Thank you Barbara for this summary. It brought back fond memories of my 2013 trip with Yoshiko. Great write up! Thanks for the wealth of information about this spectacular art, history, and culture. This opens a whole new level of appreciation for these textiles. Thank you for writing such an informative description of your trip. Greatly appreciated. So much beauty! 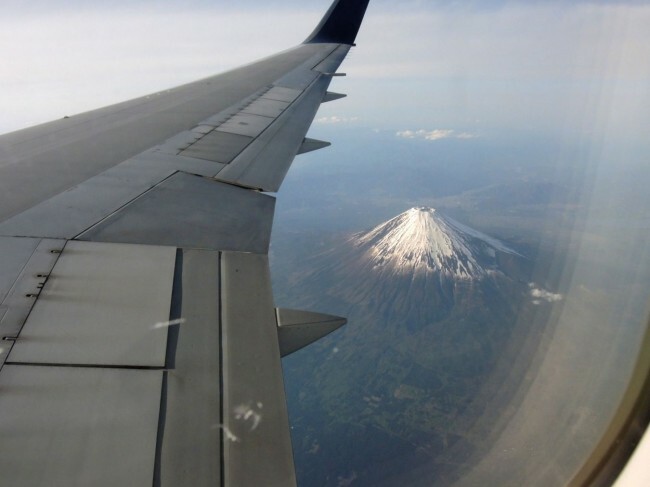 And ending with Mount Fuji! HOW INSPIRING! I really enjoyed seeing the Shibori pictures on this page! Wonderful stuff! 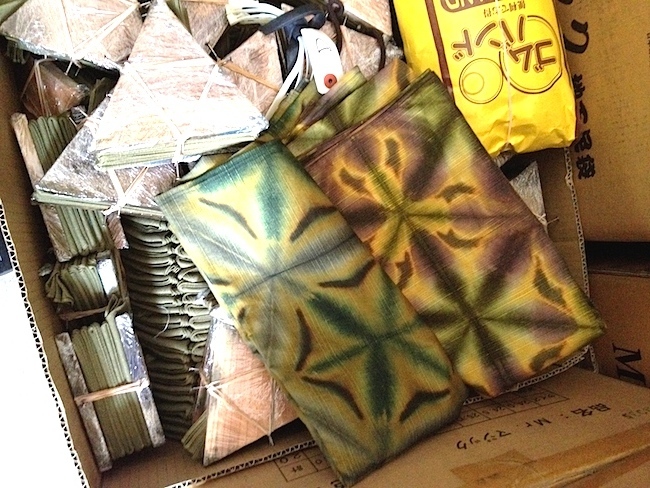 Wornderful report of the shibori state in Japan; full of relevant names of this industry to follow. I have been in Japan studying fish culture I would go again!! To visit the textile museum! Thank you for your wonderful report on your textile tour with Yoshiko. How I wish I could take a tour myself. I first learned shibori at Fiberworks in the late 1970s. It is one of my great pleasures. I have taught shibori at a Japanese summer school in Berkeley for 25 years, teaching 8 year olds a stitched technique. I must have taught over 300 students. It gives me great satisfaction and joy to share.